How can a tiny mineral called magnetite help to unravel hydrocarbon seepage and subsurface petrology? It’s not MAGIC – it’s MAGNETICS… in integrated workflows! Magnetite from Bolivia. These crystals measure over 1 cm across. 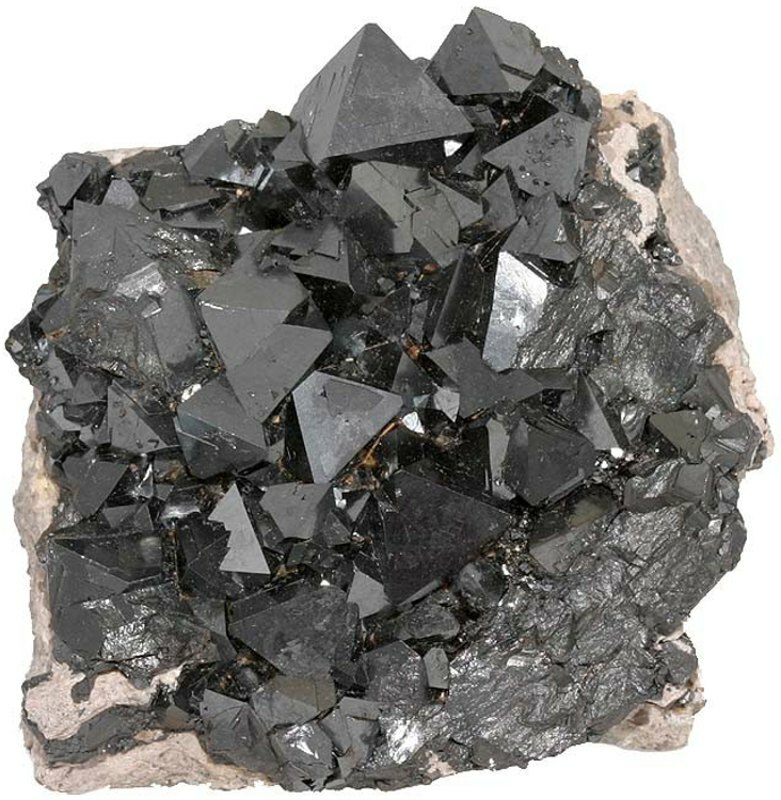 (Source: Rob Lavinsky/Wikipedia) Magnetite is the most important member in the family of magnetic minerals, which are found in varying amounts in crystalline rocks and to a lesser extent in sediments. Magnetite has the ability to respond to a magnetic field by generating its own field, known as the induced magnetic field. In oceanic crustal rocks, it is common for magnetic minerals to permanently hold substantial magnetic fields. These remanent fields date back to the moment when the rocks in the hot and just solidified magmas of mid-oceanic ridges cooled through the Curie point (the temperature at which magnetic materials undergo a sharp change in their magnetic properties) and captured and stored the acting magnetic field characteristics. This can be used to unravel the paleomagnetic history of the rocks. We know the direction of the Earth’s magnetic field from the compass needle pointing north. The Earth’s field looks like that of a magnetic dipole - a huge blueprint of your refrigerator magnet, but which is located in the Earth’s core. All rocks on Earth, as well as you and me, are bathed in this magnetic field and respond with induced magnetic fields. But since we do not have much magnetic material in our bodies, the fields of the rocks will dominate. Geophysics uses a parameter called magnetic susceptibility, which expresses the strength of the response of a rock to an imposed magnetic field - an easy alternative to estimating the amount of magnetic minerals in a rock sample. High magnetic susceptibility will give a strong induced magnetic field and vice versa. These induced magnetic fields, together with the remanent magnetic fields, cause very small deviations to the Earth’s magnetic field strength, known as magnetic anomalies. They are measured by intricate yet backpack-sized instruments, typically mounted on airplanes for hydrocarbon exploration applications. Onshore and offshore areas are mapped line by line and the results processed to create maps of magnetic anomalies, which present the sum of the induced and remanent magnetic anomalies of every single magnetic mineral in the subsurface; in other words, they reflect the distribution of magnetic susceptibility and remanence. In order to understand the recorded anomalies at the surface, imagine that the magnetic minerals form a choir and you are the magnetometer ‘listening’ to the choir from the front. You will easily hear the nearest singers, but listening to those further away gets more and more difficult with increasing distance - only if somebody far away is singing very loudly with a megaphone, will you hear them. The shallowest magnetic rocks in the subsurface are nearest to the magnetometer and will as such generate the strongest anomalies and show a lot of details. With increasing depth, the anomalies become smaller in amplitude and lose details, as illustrated in the left part of Figure 1. 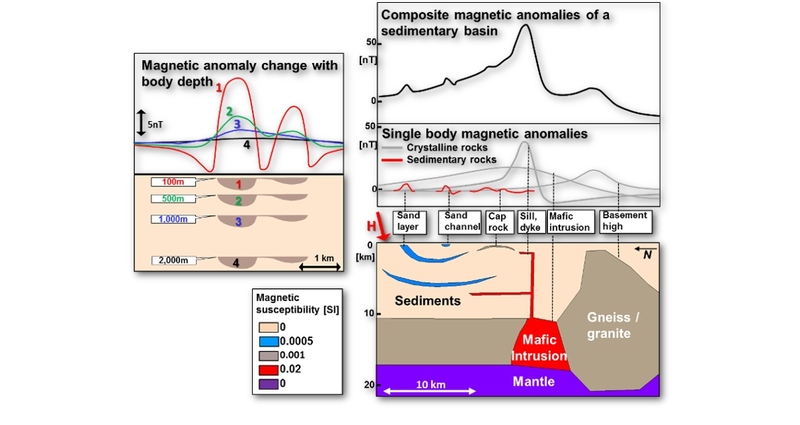 The right-hand image of Figure 1 illustrates magnetic rocks in sediments and crust and their associated magnetic anomalies: in our choir analogy, the large anomalies (grey) from the crystalline rocks are the ‘singers with megaphones’, while the tiny, small scale anomalies (red) from just a very few structures in the sediments are the ‘singers in the front’. The most important thing to understand about sedimentary anomalies is that they are small in amplitude and as such are only detectable if located in the uppermost kilometer of the subsurface. Furthermore, mapping them needs high resolution data, which means acquisition with dense line spacing and high accuracy. High pass filtering of the magnetic data brings out the shallow sedimentary anomalies of short wavelength. This is illustrated in Figure 2, which compares high pass filtered anomalies of both high resolution magnetic data and global magnetic data; note the difference! 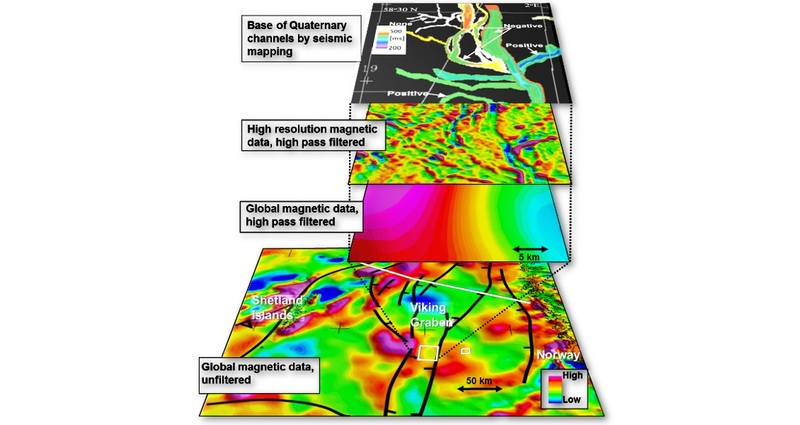 Figure 2: Upper maps: seismically mapped Quaternary channels and high pass filtered, high-resolution magnetic data (modified from Fichler, Henriksen, Rueslåtten and Hovland, 2005; magnetic data: VGVG /TGS-Nopec , 1995). Lowermost map: global magnetic data (EMAG2; www.geomag.org, 2009) of the northern North Sea; the area marked by the larger white box is filtered in the same way as the high resolution data and shown in the second lowest map. The smaller box marks the area shown in Figure 4 and the white line shows the location of the profile in Figure 5. Magnetic minerals deposited in sedimentary layers reflect the provenance of the sediments. For the continental shelf offshore Norway, Mørk, McEnroe and Olesen (2002) documented that the magnetic susceptibility and remanence are generally small, and few sands and shales were found to have high values. These workers also showed that diagenetic magnetic mineralization in the form of highly magnetic siderite cementation is observed in some dark shales, a phenomenon which can also be seen at outcrops of source rocks. In Venezuela an increased content of magnetic minerals was found in cap rocks of oil-filled reservoirs by Perez-Perez, Onofrio, Bosch and Zapata (2011). These and other effects may cause small magnetic anomalies and it has been suggested that they form indirect hydrocarbon indicators; many case histories can be found if you dig into the literature. However, the big problem is the inherent ambiguity in the interpretation. Small magnetic anomalies are caused by many shallow sources, not just by chemical changes due to hydrocarbons. Common sources are depositional and erosional patterns, sills and dykes, hydrothermal systems and, looking at onshore environments, the tropical weathering product called laterite. How can you tell the difference? The only way forward is through integrating magnetic anomaly interpretation with other data. Let’s look at some examples from the North Sea where combining the interpretation of magnetic and 3D seismic data could explain some of the shallow anomalies. One distinct group of sedimentary magnetic anomalies is related to melt-water channels which are eroded and filled by glaciogenic sediments due to repeated glaciations and deglaciations in the Pleistocene. The resulting spaghetti pattern of cross-cutting channels is shown in Figure 2. Some channels generate positive anomalies, others negative ones as a consequence of the susceptibility contrast between infill and host rock, which can vary between negative, zero or positive. These channeled sands may form a reservoir rock, as proven by the small, shallow discovery, Peon, in the northern North Sea. 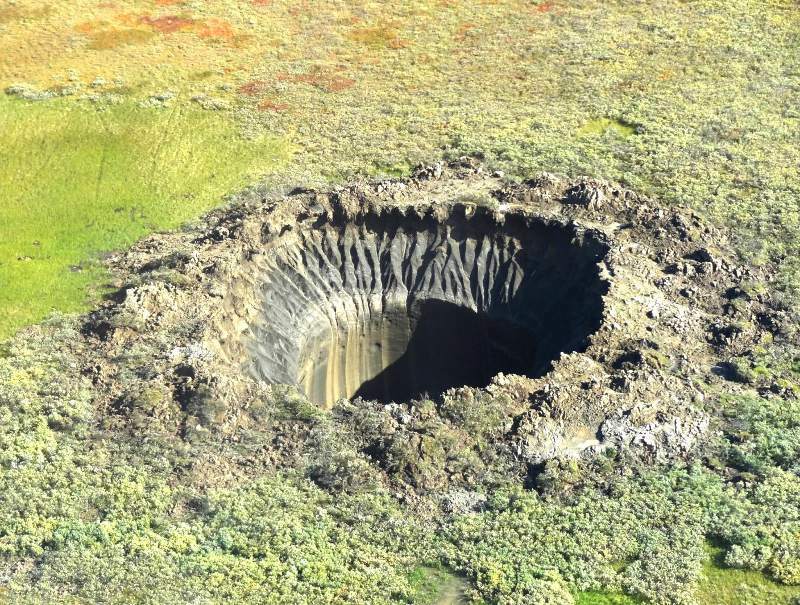 Figure 3: Gas blowout crater in the Russian Arctic. (Source: Vasily Bogoyavlensky) Magnetic anomalies have yet further relevance in the search for hydrocarbons. If hydrocarbon gas seeped into the permafrost during the Pleistocene glaciation periods, gas hydrates will have been precipitated and, in the next warm period, would melt and be released. The melting of gas hydrates below tight cap rocks is known to create blowout craters, as spectacularly observed in the Russian Arctic (see Figure 3 opposite, and Gas Blowouts on the Yamal and Gydan Peninsulas by Vasily Bogoyavlensky), and if such a crater is later filled with magnetic sediments, the result is a magnetic anomaly. This rather special hydrocarbon seepage indicator is illustrated in Figure 4, showing a circular magnetic anomaly from the eastern shoulder of the Viking Graben. 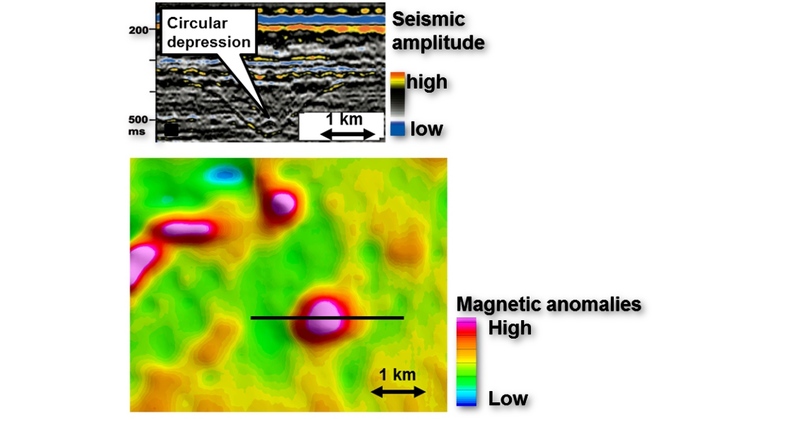 Figure 4: Depression on seismic section correlating with a circular magnetic anomaly; interpreted as gas hydrate expulsion crater filled with magnetic glaciogenic sediments (modified from Fichler, Henriksen, Rueslåtten & Hovland, 2005); for location see Figure 2. Black line indicates line of section. Let’s now look at the ‘singers with the megaphone’ - the crystalline basement with wide and large magnetic anomalies as introduced in Figure 1. Crustal magnetic anomalies rarely mimic the topography of the top basement, whereas gravity anomalies often do. There are several reasons for this. The magnetic susceptibility of crustal rocks varies between 10-4 and 10-1 SI units, i.e., by a factor of 1,000, whereas crustal densities just vary between 2.5 and 3.4 g/cm3, meaning that large magnetic anomalies can be generated by deep as well as by shallow rock units. An example is the deep mafic intrusion in Figure 1, which gives almost the same magnetic amplitude as the shallow basement high. However, the anomaly of the intrusion has a larger wavelength than the basement high. Such differences in shape can be used to find the depth to the top of the structure by various manual or automatic methods. Another factor affecting induced magnetic anomalies is related to the change of the Earth’s magnetic field direction, from vertical at the poles to horizontal at the equator. This explains why a magnetic body at fixed depth generates different anomaly shapes depending on its location, with a maximum anomaly over its center at the poles, a minimum at the equator, and in between a combination of maximum and minimum. The North Sea shows near-polar characteristics. 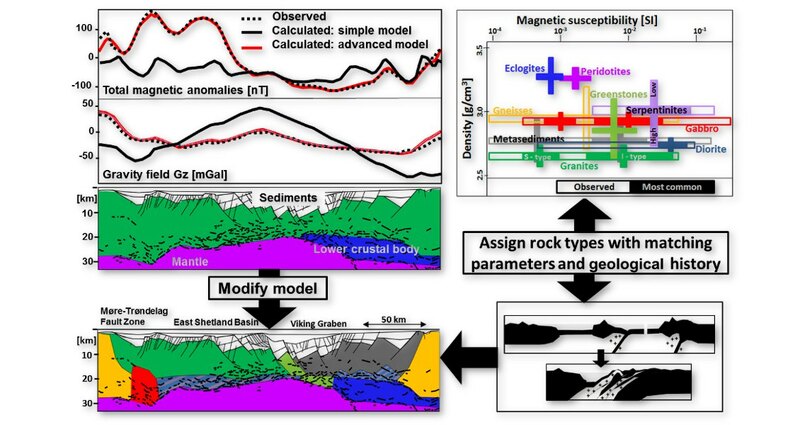 The final example (Figure 5) shows the workflow for crustal rock classification through the integration of different geophysical data. A deep seismic depth section along a 300 km-long transect crossing the northern North Sea was loaded into a gravity and magnetic modeling program. The subsurface was divided into polygons, each representing a different rock type. The divisions reflect the boundaries within sediments and crust as defined by the seismic data. Each polygon was assigned a magnetic susceptibility and density. Well data provided sedimentary densities and magnetic susceptibilities as well as the depth to the top crystalline basement, the latter found to consist of mainly granitic rocks. In the initial model, the parameters for granites were used for the entire crust. The mantle was assigned peridotite parameters and the high velocity body in the lower crust was given eclogite parameters. The calculated gravity and magnetic anomalies of this simple model showed a large mismatch, especially in the long wave length-range, indicating a need for modification in the deep parts of the crust. The gravity and magnetic anomalies governed the crustal modification, which resulted in a model of more complex density and susceptibility distributions. The final model matches observed gravity and magnetic anomalies as well as rock types considered geologically reasonable with respect to the geological history. Modeling in general carries an inherent uncertainty and the interpreter should therefore include alternative models where feasible. You can apply this workflow to detect granitic rocks, known for their high radiogenic heat production which influences hydrocarbon maturation (Hokstad, Tasarova, Kyrkjebø, Fichler, Wiik and Duffaut, 2016), or to map the boundary between oceanic and continental crust. Furthermore, detection of intrusives, which have brought hot magma into crust or sediments, may also be of importance for unraveling the thermal history of a sedimentary basin. Summing up, magnetic data contributes to hydrocarbon exploration on a broad scale and in mainly integrated geophysical interpretation tasks. It can address problems from the deep crust to the shallowest sedimentary strata. Magnetic data on a large scale is globally available at low cost or even free. High resolution data is more expensive, but is still only a fraction of the cost of a seismic survey. Guest author, Christine Fichler holds a PhD in geophysics (1985) from the Karlsruhe Institute of Technology (KIT) in Germany. A post-doc. position at the Dept. 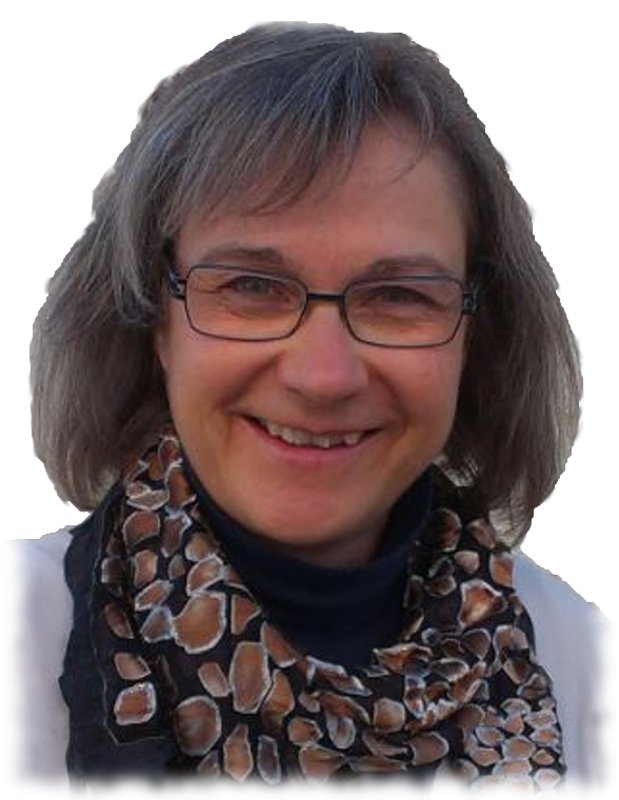 of Petroleum Engineering and Applied Geophysics at the Norwegian University of Science and Technology (NTNU) followed (1986-1990) and, in 1990, Christine became a Specialist Geophysicst at Statoil, Norway. Since 2013 Christine has been Adjunct Professor at the Dept. for Geology and Mineral Resources Engineering, Norwegian University of Science and Technology (NTNU). Editors Martin Landrø and Lasse Amundsen are regular contributors to Geo ExPro. You can find more articles by these authors by using the search function at the top of this page or by following this link.